The book that I got in the Classics Club Spin is The Kill by Emile Zola which was first published in 1872 and it’s the second book in his Rougon Macquart series. I think this is about the fifth book in that series that I’ve read and it is the one that I’ve liked least. However it’s one of his earliest books and he obviously improved with maturity. The setting is Paris 1852 and Aristide Rougon has gone there having left his native Provence. He hopes to get help from his older brother and eventually he does get a job with his help, he’s a surveyor of roads. It isn’t really what he was looking for but he realises that the work gives him access to important city planning decisions and this means that he can take advantage by buying up tracts of land that he knows will be needed in the rebuilding of the new Paris. He’ll make lots of money when the land is bought from him by the city. Aristide is a born wheeler dealer and when his wife dies he marries Renee a young woman from a wealthy family. She is already pregnant and needs a husband. Aristide can use her money for his business dealings, but although Renee is much younger than Aristide and is very pretty, he isn’t really interested in her, she’s just a business deal as far as he is concerned. They both have affairs and Renee eventually ends up having an affair with Aristide’s son by his first wife. She spends a fortune on her clothes and has to borrow to pay some money towards her debts. Meanwhile Aristide realises that he isn’t such a brilliant businessman as he thought he was. The subject matter of massive greed, waste and infidelities didn’t appeal to me and the book is very overwritten. I like descriptions but there are far too many of them in this book – too many adjectives, too much purple prose. I’ll definitely be continuing with this series though. 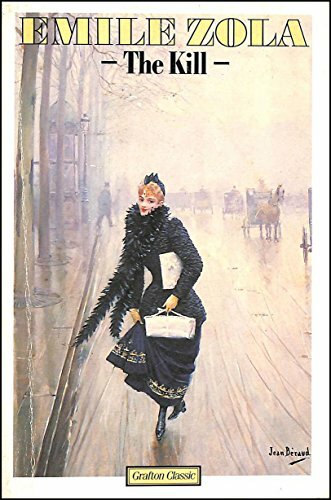 This entry was posted in Books and tagged Classics Club, Classics Club spin 18, Emile Zola, French classic literature, Rougon Macquart series, The Kill by Katrina. Bookmark the permalink. I’ve read this one but it’s not one of my favorites by Zola — the characters were so awful, which is typical of Zola, but I didn’t find them particularly fascinating. I think so far my favorites have been La Bete Humaine and Pot-Bouille, which comes just before The Ladies’ Paradise. The Earth and L’Assommoir are also really good. I just got a new translation of The Bright Side of Life and am hoping to finish it soon. I think there’s only one more in the series that doesn’t have a recent translation, Doctor Pascal, so hopefully OUP will translate that one as well. As you say, the characters were awful, but somehow very French! I’ve really enjoyed La Bete Humaine and The Ladies Paradise but haven’t read the others you mention. I really liked Germinal too but that isn’t part of the series (I think). A very interesting review. I’m wondering, and maybe you know. Why did Zola, if he didn’t know the era or society well that he wrote about it–why did he do it? Was it considered “a golden age” or “une belle epoche?” (I left out the accent on epoche.) I’m curious, because you know, I simply have never turned my attention to classic French authors. Fairly witless on that subject, actually. Oh, gosh! I feel so badly for Andy Murray–he retired out of the U.S. Open and he is clearly limping around in terrible pain. I suppose he did it because it was about a time of change and being in France there was a lot of vice/sin around so plenty to interest readers! Maybe I’m being cheeky and it was the same elsewhere though. I suspect that that sort of book was what he thought would sell well. Our weather is up and down. It was gorgeous yesterday, nearly 70F here, but today was grey and overcast and maybe about 60F. It’s to be lovely again tomorrow. I really fear that Andy will never be on top form again, but I live in hope. At least if he has to give up completely he should be financially secure. I’d love to see him back on top form though. But yes, the whole thing felt rather gaudy, grubby and over the top. I must admit that the part where Renee and Max are in the conservatory/hot house was very well done as I’ve always seen many of those exotic plants as being almost quite wicked looking. I’m wondering which of his books to read next.